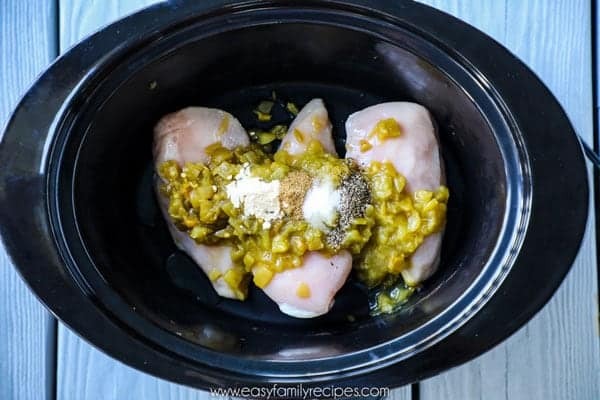 This Crock Pot Green Chile Chicken recipe may be the best slow cooker recipe you have ever eaten! It is super easy to prep with only 7 every day ingredients, and the result is the most tender, creamy, flavor filled shredded chicken. 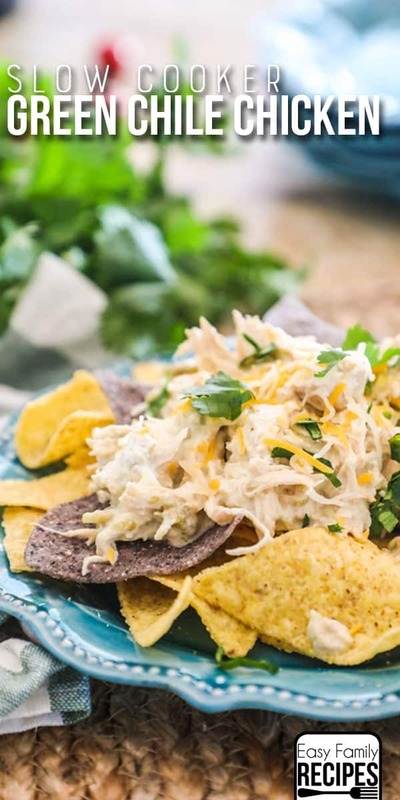 The crock pot green chile chicken can be eaten as is, or used as a filling for tacos, enchiladas, burrito bowls and more! News Flash! 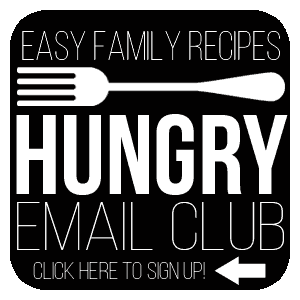 If you love easy recipes as much as me, make sure to sign up for my Hungry Email Club! I send out weekly emails with easy meal time ideas and inspiration. To sign up, Click HERE or on the button below! 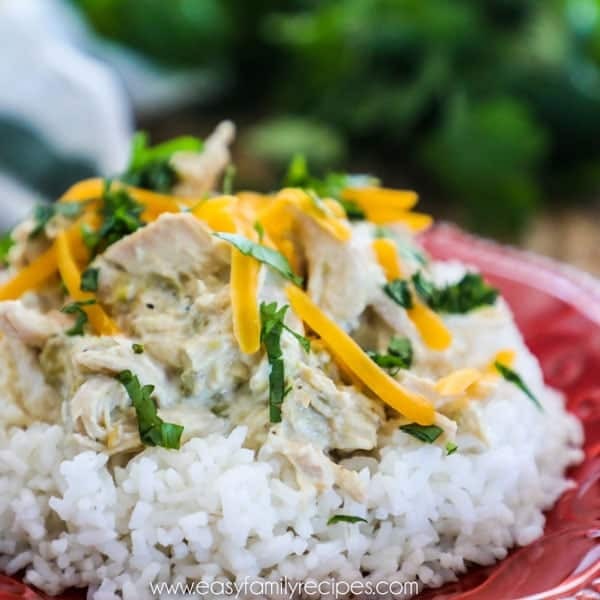 I think this Crock Pot Green Chile Chicken is my favorite crock pot recipe of all time. I have made a lot of slow cooker recipes over the years, especially a lot of chicken recipes. 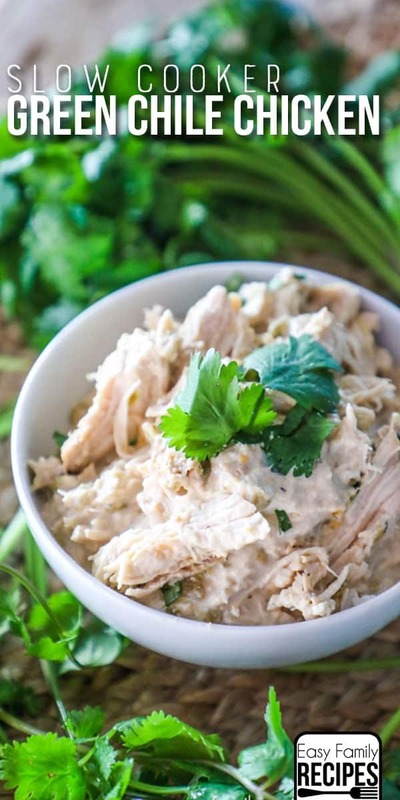 I have made some I really love, like this Slow Cooker Thai Chicken. But this recipe just blew me out of the water! I really didn’t know it was going to taste so crazy good! You know the level of good… where the hubs walks in the door, takes a little taste as he is strolling by, but then turns around for a few more bites, because it was unexpectedly delicious! It all started when I created this Baked Green Chile Chicken recipe. 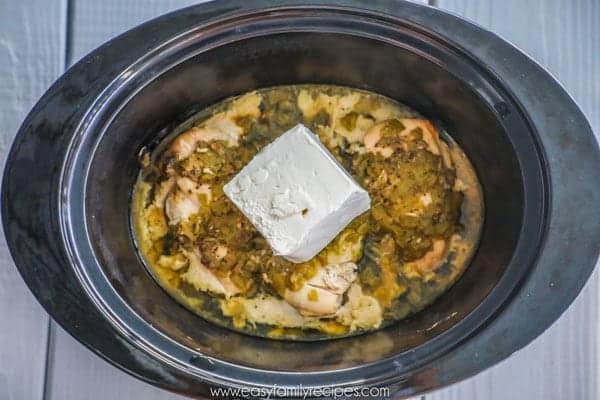 Chicken smothered in green chiles, cheeses, and Mexican spices…. What’s not to love?! Well, turns out a lot of people agree and it has grown to become one of the most loved recipes on my site and in my home. So naturally, people started asking me different questions, like if it could be made with rice and if you could make it in a crockpot. And so I have slowly but surely been working my way through those questions and working out the kinks so that this recipe can be made all sorts of different ways! Today is the day we are going to talk all about how to make Green Chile Chicken crock pot style! If you have something you use this recipe for that I didn’t list, I would love for you to let me know in the comments so I can give it a try! I am going to walk you through how I make this recipe step by step here with all of my notes, tips and tricks and freezer instructions. If you just want the quick version of the recipe, scroll down to the recipe card at the bottom of this post. Follow the recipe below for a six serving portion of the dish, or double the recipe by doubling the ingredients and using the instructions as is. 3 boneless skinless chicken breasts (about 2 lbs)– Use 3-4 chicken breasts depending on size. Trim any excess fat or gristle off before you place it in the crock pot. 2- 4.5 oz cans chopped green chiles (I prefer Old El Paso)– You can also use one large (8 oz) can of chopped green chiles in leu of the 2 smaller cans. It will be slightly less chiles but the end result will be nearly the same. I always choose Old El Paso Green Chiles because they are a bit more crushed than chopped which makes the flavors combine better in my opinion. 1/2 tsp ground cumin- make sure to use ground cumin, not cumin seed. 1- 8oz package Philadelphia cream cheese- You can use the Original Philadelphia cream cheese, or the 1/3 less fat, just avoid the fat free variety because it doesn’t melt the same and won’t give you a very good result. Lay the chicken breasts flat on the bottom of the slow cooker. Cover with the green chilis, garlic powder, cumin, salt and pepper. Give the chiles and the seasonings a stir with a fork to combine them before cooking. Cover and set to high for 3 hours. 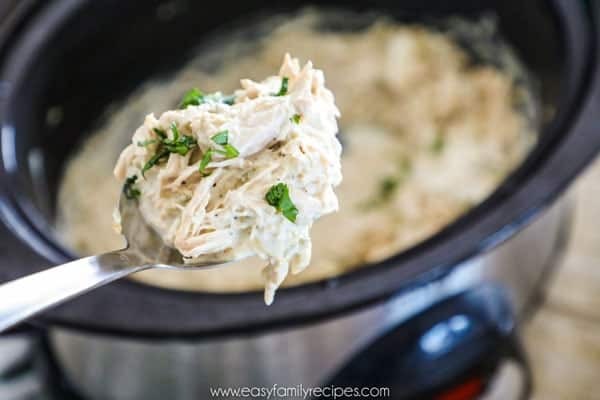 Lay the cream cheese on top of the shredded chicken and replace the lid and continue to cook on high for 30 more minutes. This will soften the cream cheese, even if it is straight out of the fridge which is what I usually do. 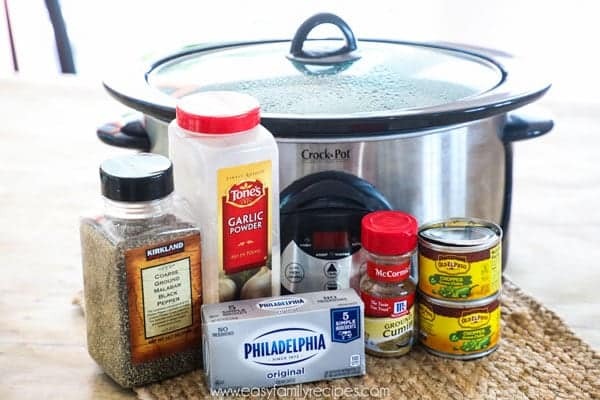 If you try to mix it while it is cold it gets clumpy and won’t combine well, but by letting it soften in the slow cooker for 30 minutes, you are able to mix it right in smoothly. When the timer sounds remove the lid and mix the cream cheese into the chicken. Serve hot and enjoy! You can eat it just like that, or use it as a topping for any of your favorite Mexican dishes. Place chicken breast, green chiles and spices in a freezer bag. When ready to cook, place entire contents of bag in crock pot and cook on low for 5-6 hours. 30 minutes before cooking is complete, shred chicken and add cream cheese to soften. When cooking is complete, stir in cream cheese to combine. I really hope that you and your family enjoy this recipe as much as we do! If you get a chance to make it, I would love it if you would take a moment to leave me a note in the comments. It just makes my day to know people are making and enjoying my recipes. Even better, snap a photo and tag me on Instagram @easyfamilyrecipes so I can see what you are cooking! And before you go… don’t forget to sign up for my Hungry Email Club for more easy recipes! This green chile chicken made in the slow cooker is super easy to make and so unbelievably flavorful! It is perfect served on top of rice or as a filling for tacos, enchiladas, or burritos. 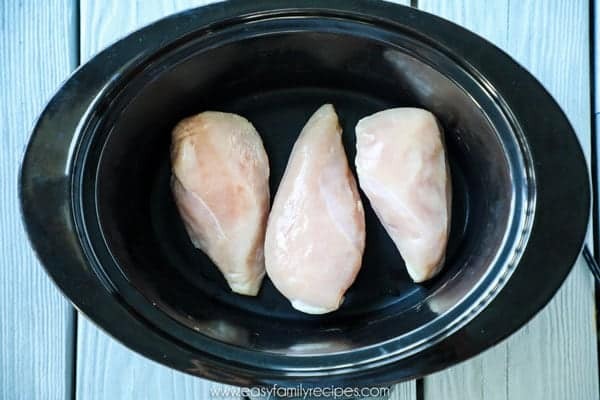 Lay the chicken breasts flat on the bottom of the slow cooker. Cover with the green chilis, garlic powder, cumin, salt and pepper. Cover and set to high for 3 hours. At 2.5 hours, open the lid and use forks to shred the chicken and mix it with the juices. Then lay the cream cheese on top of the shredded chicken and replace the lid and continue to cook on low for 30 more minutes. When the timer sounds remove the lid and mix the cream cheese into the chicken. Serve hot and enjoy! To Freeze: Place chicken breast, green chiles and spices in a freezer bag. When ready to cook, place entire contents of bag in crock pot and cook on low for 5-6 hours. 30 minutes before cooking is complete, shred chicken and add cream cheese. When cooking is complete, stir in cream cheese to combine. Any suggestions to substitute the cream cheese with? My husband hates hates hates! Cream cheese. I was wondering if just a guess/cheese and pepper blend could work.. a softer cheese of some sort. Hmmmm, that is a tough one! I honestly don’t like cream cheese as is, but I do enjoy the flavor when you cook with it. You might could try doing a mixture of sour cream, monterey jack cheese and see how that goes. It definitely won’t be the same, but it will still have a similar flavor! Or another thought, you could use a bit of cream of chicken soup. That may bring in the richness without using cream cheese. Good luck! In your chicken chili bake recipe you use monterrey cheese. Could i add that to the crockpot as well? Our family loves cheese. I would add it at the end, recover with the lid to let it melt for 5-10 minutes then serve. That way you will avoid over cooking the cheese and really get the most flavor out of it. Enjoy!